This book is a great addition to my "Hero Month," because there are a whole lot of heroes in here, mostly people just managing to go on in spite of terrible things. Ordinary heroes, you might say. This sequel made me want to go back and re-read The War That Saved My Life. Not so much because I needed to know details that I've forgotten (though that wouldn't hurt; this follows right on and it took me a bit to come up to speed, though everything is adequately explained to allow you to read it as a stand-alone), as because the books are so good. In some ways, there isn't as much of a story arc here as in the first book. The really big questions have been settled: Ada and Jamie are living with Susan, and her clubfoot has been fixed, allowing Ada to stop seeing herself as something worthless. Now she has to learn to be a normal child, and it's a struggle. That struggle, along with the blows that war brings to those around her (even while Ada is aware that the war has brought her far more good than ill), is what makes this story interesting. Narrator Jayne Entwistle is excellent, as always. It caught me by surprise, as familiar narrators often do, since I strongly associate her voice with Flavia du Luce. But after a chapter or so I was firmly clear on this being Ada (though she probably could have used a bit more East End in her accent). I'll peg this series for kids about 8 and up. It deals with some fairly heavy stuff--war and death--but in ways that I think make it accessible and not frightening for younger children. The lessons about acceptance and human value are still here, but where at times I felt in the first book that the author was a little heavy-handed with them, in this one the balance feels right. In print or audio, this is well worth reading. FTC Disclosure: I checked The War I Finally Won out of my (digital) library, and received nothing from the writer or publisher for my honest review. The opinions expressed are my own and those of no one else. I am disclosing this in accordance with the Federal Trade Commission's 16 CFR, Part 255: "Guides Concerning the Use of Endorsements and Testimonials in Advertising." This sounds like a series I would have liked as a kid. I loved historical fiction. It is very good. If you still like historical fiction, give it a read! Interesting - and I love the cover. 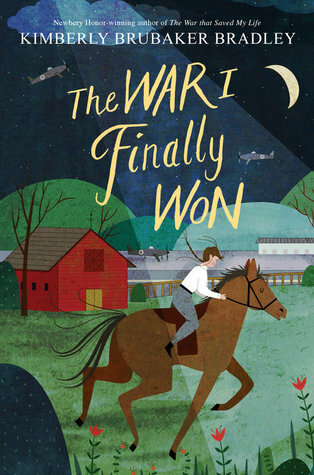 I didn't get to read The War that saved my Life when we did it on GMGR, but I'm sure I still have it on my TBR list.